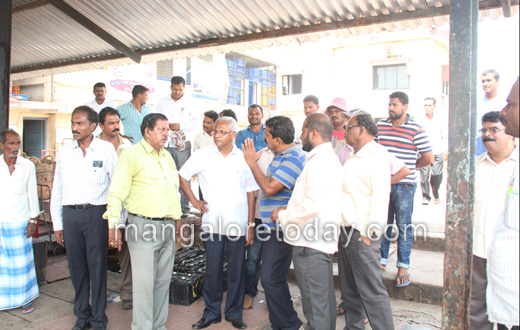 Mangaluru, April 6, 2015: Leaders of fisheries related trade unions demonstrated in front of the office of the deputy director of fisheries here on Monday. They were protesting against the government’s plan to directly transfer diesel subsidy to the accounts of mechanised fishing boat owners. Out of the 924 trawl and purse seine boats registered, 780 are eligible for the subsidy. The government has been waiving sales tax of about Rs. 7 per litre of diesel sold to them. At present they can buy diesel at a concessional price. Under the new scheme, the fishermen will have to pay the full, non-subsidised amount and wait for refund of concession into their account. The State Government proposes to transfer an amount equal to the average subsidy obtained in the month of March in advance immediately after the boats register the bank account number of owners. Subsequently it will pay them soon after the diesel is purchased. It earmarked Rs. 105 crore for this in the recent budget and has already released Rs. 10.6 crore for payment. President of Trawl Boat Fishermen’s Association Nitin Kumar said the fishermen fear that the government may withdraw the scheme suddenly claiming it did not have funds for fund transfer. Or the government could also postpone payment under the same pretext. Also, fishermen who had more than one boat in a family were likely to be denied subsidy for additional fishing gears, he said. There were about 200 such families. Deputy Director M.D. Prasad, who maintained that the scheme was meant to stop pilferage, said guidelines were awaited on extending the subsidy to additional boats. He said the scheme had not taken off because boat owners had not registered their account numbers with his office. 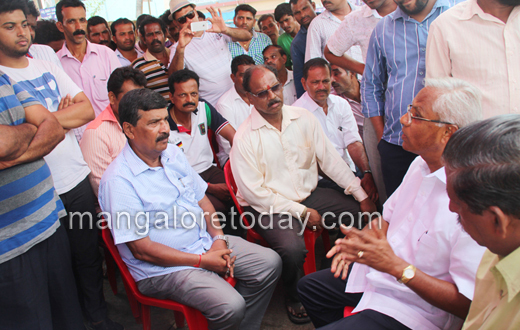 Later MLA J.R Lobo met the protesting fishermen and promised to speak to the state government and come to a amicable decision.